​To purchase any featured item below simply click on it's picture. Extend a spooky and fun welcome to trick or treaters and guests this Halloween with our exclusive Stop In For A Scare Personalized Doormat! We will creatively personalize any family name or first names within our unique artwork for an impressive, personal touch! The fun saying "Stop In For A Scare" will automatically appear above the personalization you choose. The personalization will appear in all capital letters. ​Celebrate all the spook-tacular people you call family with a frightful welcome, indoors or outdoors, with our exclusive Halloween Character Collection Doormat. Our exclusive cartoon figures are featured in Halloween costumes depicting each family member - including pets - with everyone's first name appearing underneath. Across the top, we feature your family name, making it a keepsake for treasured memories! There's no trick to figuring out who owns these goodies, stashed in their very own personalized Dracula Pumpkin Personalized Plush Treat Bag. We custom embroider the name of your little "Dracula" in the font style shown in coordinating white thread. Measures 8"H x 8" center diameter. Spot clean. Our Sweets & Treats Personalized Halloween Mini Metal Bucket is personalized with a large printed sticker in your choice of 3 color options. Add any line of personalization followed by their name, claiming complete ownership of the bounty of treats inside! Choose from 4 bucket colors. Candy is not included. Tinplate bucket measures 4"H x 5"W.
Metal handle with wood grip. Not food safe- fill with wrapped treats only. We custom embroider the name of your little "pumpkin" in the font style shown in coordinating black thread. Quality constructed from 100% durable plush cotton with polyester batting. 8"H x 8" in diameter, to handle small or larger loads. ​Miss Pumpkin Embroidered Plush Treat Bag. We custom embroider the name of your little miss pumpkin in the curly font style shown in coordinating black thread. Design features 3-D intricate appliqué and embroidered detail, making the bag stand out from all the rest! Freaky Frankie Embroidered Plush Treat Bag! We custom embroider the name of your little "monster" in the font style shown in coordinating green thread, Whimsical, spooky design features 3-D ears and "knobs" on squared bag design. Measures a generous 8"H x 12" center diameter, to handle small or larger loads. We will skillfully etch up to 4 lines of text in between our Halloween-themed spider web design, making a memorable personalized gift you will enjoy using time and time again! Sold individually. Straws sold separately. Raffia not included. Holds 16 oz. of liquid. Not intended for hot drinks. Our exclusive cartoon figures are featured in Halloween costumes depicting each family member - including pets - with everyone's first name appearing underneath. Across the top, we feature your address and family name below, making it a keepsake for treasured memories! 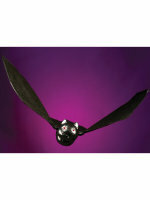 Halloween Accessories from Anytime Costumes. We scream for lots of different reasons: Sometimes when we're excited about something we shout for joy, or we may scream in anger when we're arguing with someone. 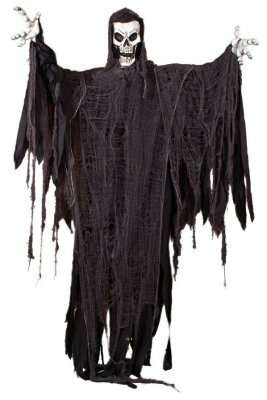 Most of the time we scream in fear, like if someone creeps up and frightens you or you scream when you see a creepy crawling spider, and if you want to make your friends scream whenever they come to your place this trick or treat season, then use this 72 Hanging Silent Scream Ghost Prop. 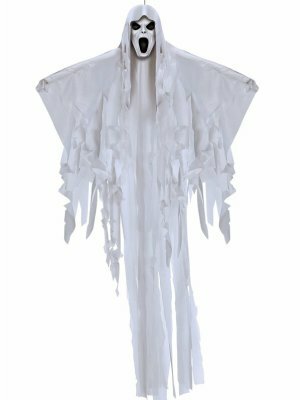 It features a howling, hooded white ghost head and matching long tattered robe with fringe accents; more than enough to have people screaming at the top of their lungs. 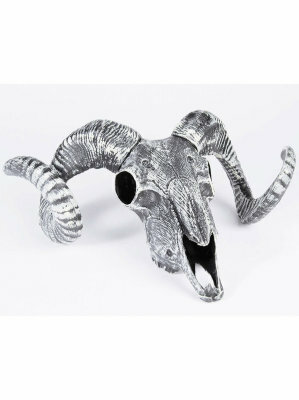 Creepify your surroundings with this Haunted Sheep Skull Prop. This stark decoration recreates the appearance of a rotted out ram's skull. This hangable wall prop also sports a weathered black and white finish. This haunting image is an easy way to give your plans a horror-themed edge. Requires 2-AA batteries. Not Included.